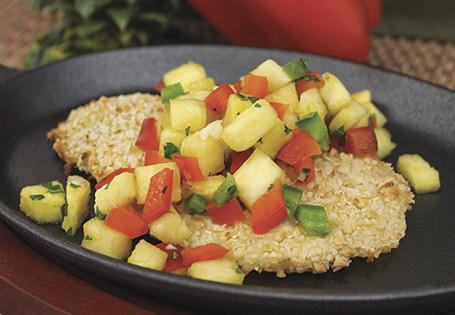 A colorful dish to entice even picky eaters! For salsa: In a medium bowl, combine the salsa ingredients. Refrigerate while preparing fish. For fish: Coat a baking sheet with cooking spray. Pat fish dry, season with salt and pepper on both sides. In a food processor, process almonds and coconut into coarse crumbs. Pour into a medium bowl. Set up a breading assembly line with corn starch in one bowl and eggs in another. Dredge fish in the corn starch, then egg, then the coconut mixture. Place fish on prepared baking sheet. Spray the tops with cooking spray. Bake 15 minutes. Plate the fish first and top with a generous amount of salsa.